To say I was a little excited for Verdi's interpretation of Macbeth – presented by OperaDelaware – would be an understatement. I grew up on Shakespeare, and Macbeth has always been a particular favorite of mine. It has a little bit of everything that makes for good drama: love, violence, blood, war, mystery and intrigue. The characters are full of depth, secrets and desire, all of which translates beautifully into an opera that Giuseppe Verdi carefully crafts. The precise execution (no pun intended) by OperaDelaware leaves you a little breathless, after listening to the likes of Courtney Ames (Lady Macbeth), Ben Wager (Banquo), Jason Wickson (Macduff) and Grant Youngblood (Macbeth). The show opens with a child-like lullaby from the orchestra, conducted by Giovanni Reggioli, visually complemented by a rolling fog across the dramatically lit stage, and strong rock-like structures jutting from the ground. It's here that we get the first look at a series of amazing period costumes meticulously crafted fabricated by AT Jones & John Lehmeyer. They skillfully combined modern elements such as re-imagined UGG boots for Malcolm, and other ingenious illusions. These meticulous technical details should not be missed, as they only amplify the drama and passionate performances that are played out over the next four acts of Verdi's Macbeth. The audience gets their first taste of the amazingly talented artists early in the show, with a soliloquy from Courtney Ames as Lady Macbeth. It's in this tender moment we see her sheer passion for Macbeth juxtaposed by a devious demeanor for the downfall of King Duncan, and quick succession of her husband. Ms. Ames leads the audience on the riveting journey, through summoning the power of dark aid, contriving against the King and questioning the very action and commitment of Macbeth. The scene comes to a close with a distraught Macbeth, hands dripping of Duncan's blood. (Props again go to the technical crew for pretty darn realistic stage blood. These small details sell the moment of desperation playing out before your eyes. in close, Lady Macbeth conjures the idea that water will wash away their wicked deed, and all it brings. As Act II comes to a close, the reprise by the cast, with highlights from Mr. Wager, Mr. Youngblood and Mr. Wickson set the stage for what lies ahead after intermission. The voiceless ghost of Banquo provides an uneasy tenor for Macbeth as he reconciles his devilish deeds amongst a host of honored guests and members of his court. At a runtime close to three hours, the show felt more like a sitcom you wanted to binge-watch for the entire day, rather than the dramatic opera it was. Prepare to sit on the edge of your seat and clear your throat to proudly yell Bravo! during the second half. The deserving monologue by Mr. Wickson during an otherwise grievous moment was one such moment, when several audiences members vocalized their admiration for his raw talent. Before I get too ahead of myself, it's worth stopping to admire some other magnificent talent in this show, and the voices of Eric Bash (Doctor), Helen Huse Ralston (Lady in Waiting), and Toffer Mihalka (Malcolm). The second half of the opera is fraught with drama, intrigue and dark overtones with more mischief from the witches, and Macbeth's foretold future. While revisiting the witches, Macbeth learns that after his failed attempt on Malcolm (Duncan's son), the lineage of the Kings to come will certainly be from Malcolm, although he is falsely assured that his demise will not happen from any man born from a Woman. Feeling an odd sense of security in his fragile state Macbeth falls to his ills, sending Lady Macbeth into a fit and dark downward spiral. Director Cynthia Du Pont Tobias should be applauded during this particular scene, as a series of future kings is marched, one-by-one, slowly across the stage in front of a speechless Macbeth. This dramatic moment defines the devilish actions of the first half, with a glimmer of hope for Scotland that lies with Malcolm and Macduff. The production would not have been the thunderous success it was were it not for the craftsmanship of Set Designer Peter Tupitiza, Lighting Director Donald Thomas, Stage Manager Emily Butzi, and Technical Director and Set Carpenter Robert Parker. At the close of Macbeth, the stage is transformed with magnificent light and colors, emanating a sense of hope and conviction of justice after Macduff and Malcolm send Macbeth to his grave. Overall this production exceeded my expectations, with its combination of vocal talent, soothing dramatic overtones provided by the orchestra and carefully crafted technical details. Fear not if you don't understand Italian, or this is your first foray into opera, the show is super-titled by two monitors that flank the stage. 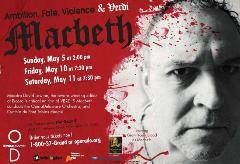 And if it is your first opera, Verdi's Macbeth is the perfect show to welcome you to this beautifully crafted medium. OperaDelaware should be commended for their great success and execution of this classic production. If you go: Friday, May 10 & Saturday, May 11 at 7:30pm, The Grand Opera House, 818 N. Market Street, Wilmington, DE 19801. For tickets, call the Grand Box Office at 302.652.5577 or purchase online: www.thegrandwilmington.org. Parking is available for free Friday after 6:00pm and all day Saturday on the street; the city-run flat lot on 8th & Orange is open and free after 8:00pm on weeknights and all weekend long. Tickets are $28, $47 and $74, though in the Grand, there really are no bad seats. Thanks for posting a review - we are very glad you enjoyed it!